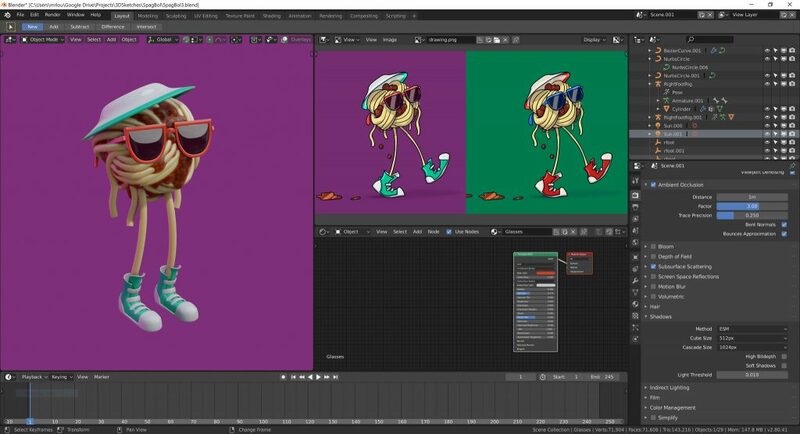 A fun little project, making a spaghetti covered meatball dance the running man. For no reason other than having created a silly song on FL studio mobile, a music creation app. 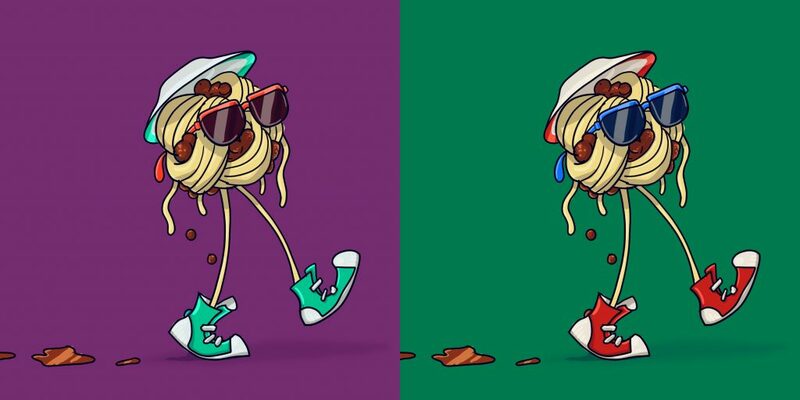 All the spaghetti was built with curves, creating spirals by using sphere vertices. Everything else was poly modelled, using the multi-res modifier for the bolognese so I could sculpt up the blobby details. I then sat back and thought ‘how the hell an I going to rig this?’. After playing around with bendy bones I settled on hooking up empties as controllers for the leg curve handles, allowing for easy control of the shape on the leg curve. For the foot rig, I looked into reverse foot rig setup, but settled on the following setup. Having a normal deform bone setup. Having 3 empty controllers. All bones as children of the heel controller, the ball and toe empties as goals for the adjacent bones. The ball empty as a child of the toe empty. To translate the foot I grab the heel and ball empties, after keying the blocked out pose, I’d offset the time of the heel, this gives a nice offset animation of the ball/toe reaching the ground before the heel or leaving the ground after. For the environment I though it was be fun to try out some texture projection, so waited for an overcast day (not hard in London, UK at the moment) and took a photo for use as a background plate and a 360 image for use as an environment map. 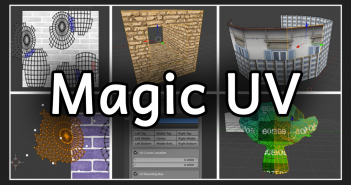 I modelled the very simple scene based on the background plate and created a camera projection UV to further line up the texture. I loaded the audio into the sequencer and started animating a toe tap by translating the toe goal empty. 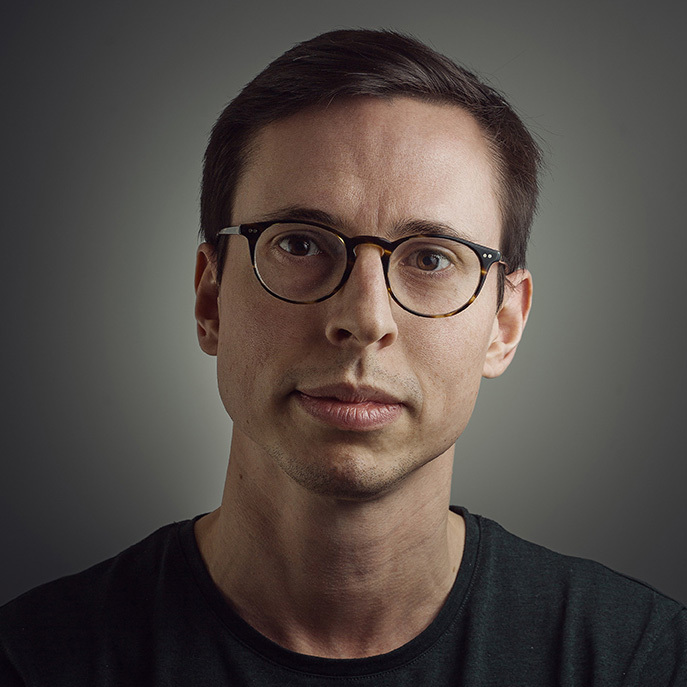 I was very happy to be able to use Blender’s Eevee realtime viewport rendering, all be it with ‘simplify’ activated to knock the sub-d levels down. As well as keyframing the primary animation and secondary animation of the plate hat, I started to play around soft body dynamics for the wobbly secondary animation of the spaghetti “hair”, which worked very well, and save tones of time. Camera animation was done by dragging the camera with autokey on and playing the scene, for both the position of the camera and the position of the empty the camera was looking at. After tweaking the materials I setup a compositing flow to give a more organic feel to the output of the Eevee renders. It was a silly project but I had a lot of fun creating it. I especially like the flailing hair. What a cool project and cool showing us your approach. Totally should have had this! Saw this on reddit - awesome stuff! Terrific! Thank you very much for sharing this, and your process. 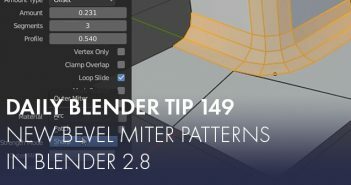 Next Article Daily Blender Tip 149: New bevel miter patterns!